You may defer activation of a document by entering a date in the future in the Activation field. This feature is ideal if there is no: product update, a software release, new policy or set of procedures that will take affect at an exact future date. This document will review how the Future Activation setting works for documents in various in dual status and Active status as well as review . 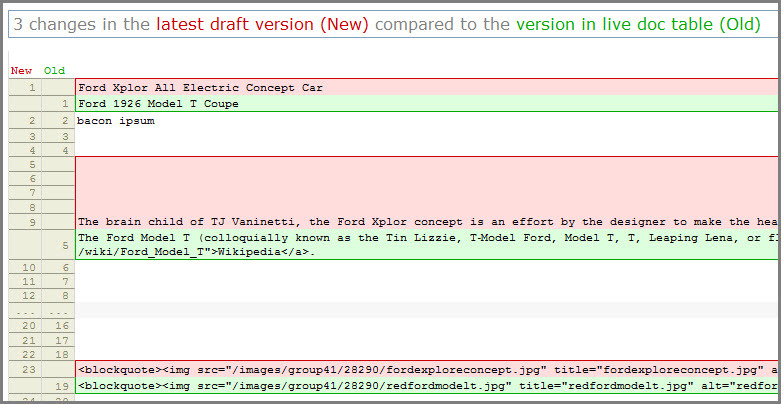 Follow your KB Group's document workflow in updating the content of a document. When you are ready to Publish, scroll down to the Activation field and set the date in the future. The image below shows the future Activation set for July 4, 2017 at 5pm for a user with Publish rights, as indicated by the Active radio button. For users who do not have Publish rights, a Future Activation date can be set, however, the Request Activation flag must be set and the Group Admin(s) must approve before publishing. In this example, we will talk about sample document 28290 which is Live on a KB Site displaying content X in some places and content Y in another. In the KB Admin Tools, this document is in status of Active but also has completely different content that will automatically be published on the Future Activation date designated. We will demonstrate the current Live document, and the content seen in different parts of the KB Admin Tools. In the image below, we see document 28290 on the Live Site. This document shows details and an image of a Ford 1926 Model T Coupe. In the KB Admin Tools, this document is saved as Active only (e.g. is it not in the dual status of Active and In Progress). When you open this document to Edit, it will have completely different content which is scheduled to be published at the designated Future Activation date. We will show you exactly how to access the content intended for Future Activation. 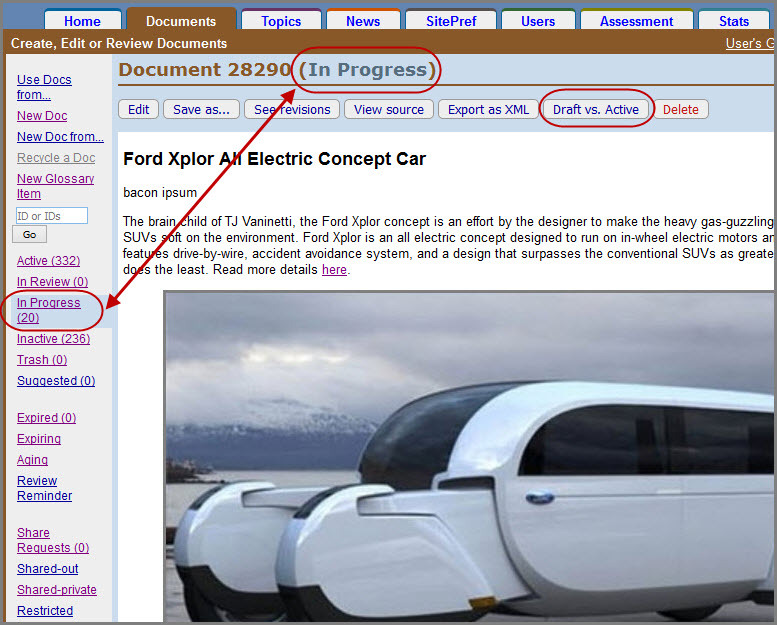 Review Mode will display content of the document in that specific queue. You will not see content intended for Future Activation in Review Mode unless you click on the Future vs. Current button. 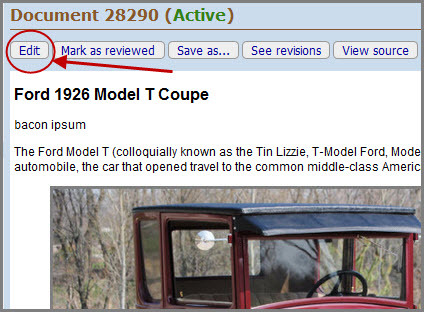 The image below shows the content of the "Ford 1926 Model T Coupe" document with the Future vs. Current button circled in red. Upon clicking the Future vs. Active button, a pop up screen will appear with a side by side comparison of the Future Active document and the currently Active document. The image below shows a detail of the comparison screen. Both document versions are clearly marked as future or current. Scrolling to the bottom of the Comparison pop up screen, you will see line by line detail about the changes applied to the document. The image below shows 3 changes highlighted in red made in the document slated for Future Activation. As we have seen, sample document 28290 displays the 1926 Model T in the Live Site and has the same 1926 Model T content when seen in Review mode. However, the document owner has completely overhauled that data, has set a Future Activation date and has saved the document as Active. 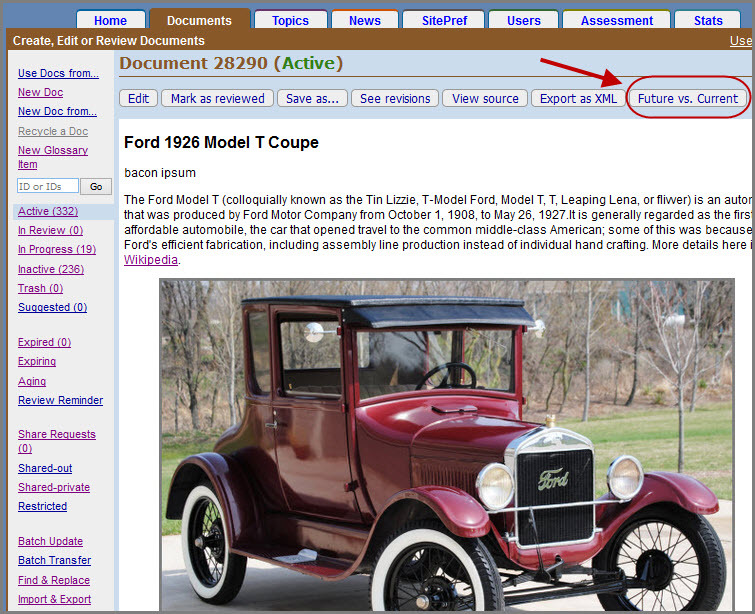 Navigation: KB Admin Tools > Documents tab > Active queue link > click on the "Ford 1926 Model T Coupe" linked document title > click on the Edit button to see the updated content that has a Future Activation date. The image below shows document 28290 in Review mode with the Edit button circled in red. 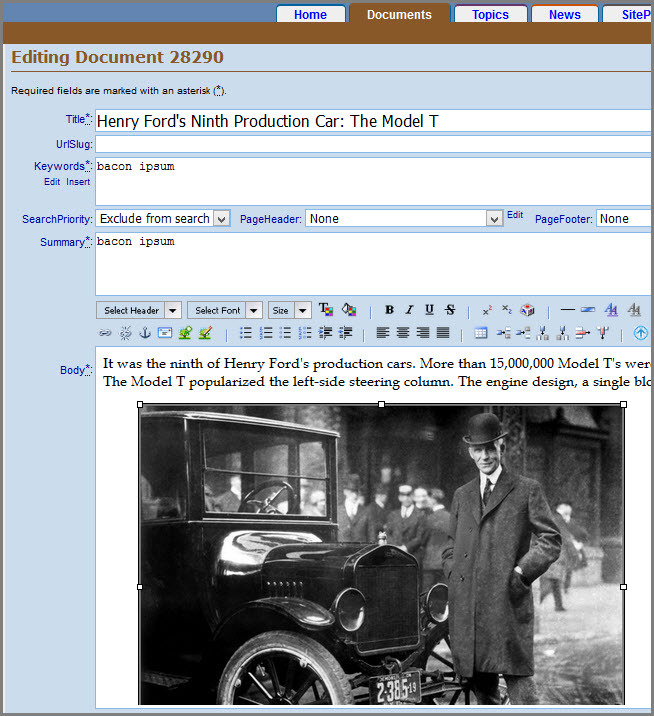 Upon entering Edit mode, we see the same document ID of 28290, however, the title of the document is "Henry Ford's Ninth Production Car: The Model T" with an image of Henry Ford, himself. When the Future Activation date and time come to pass, this document will be automatically published. The image below shows our test document, 28290, on the the Live Site. This document shows details and an image of a Ford 1926 Model T Coupe. 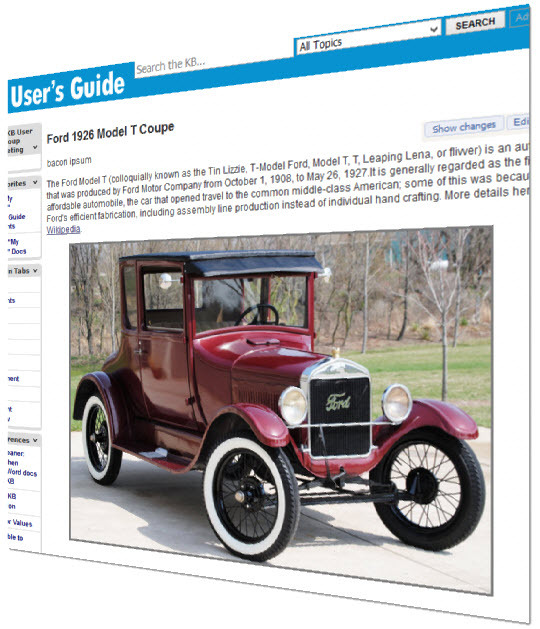 Navigation: KB Admin Tools > Documents Tab > In Progress queue > and click on the link "Ford 1926 Model T Coupe". In the image below, updates have been entered into the In Progress version of document 28290, "Ford Xplor All Electric Concept Car" with an image of a white, visionary SUV and it has a Future Expiration Date. Please note the Draft vs. Active button circled in red. NOTE: Documents set to In Progress with a Future Activation Date will not be automatically be Published on the Future Activation date and time. The document must be set to Active in order for the Future Activation to enable. Upon clicking on the the Draft vs. Active button, a pop up screen will show the Draft content side by side with the Active state of the document. The image below shows the draft state of 28290 Ford Xplor text and image of a visionary car on the left. On the right, the Active state of 28290 showing the Ford 1926 Model T.
At the bottom of the Draft vs. Active screen is the line by line comparison of both versions of the document. The image below shows our sample content in document 28290 set for Future Activation date. The live content is in green, the content in that is In Progress and set for Future Activation is in red. Again, documents set to In Progress with a Future Activation Date will not be automatically be Published on the Future Activation date and time. The document must be set to Active in order for the Future Activation date to enable.